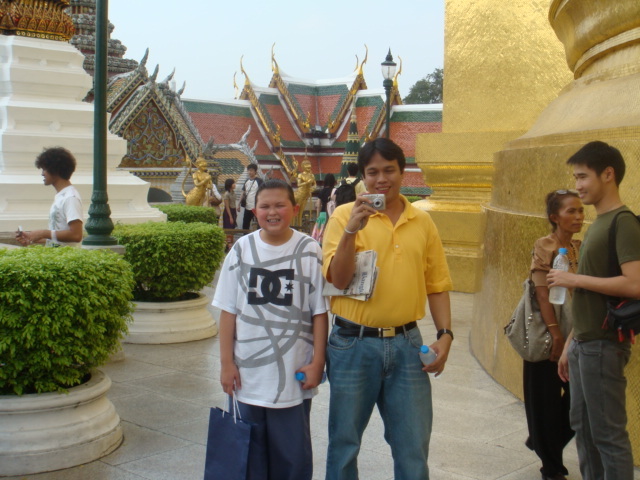 Taken at the Grand Palace of Bangkok, formerly home of the Royal Family. Kyle is such a sweet brother, super friendly - liwat sa inahan ug amahan. I agree with you, Mike, 100%! Not just gwapo and friendly but very, very smart boy! He sent me his report card and I was so amazed with his grades! Do you know Grace that while Kyle was on travel, gipangdala niya iyang usa ka dosena nga libro. Maoy nakabug-at sa iyang bag. And Kyle is still 11 years old, yet he already reads a lot. Diha ka Mike? That's pretty amazing for young kid like him kay gusto man jud laag unta but he is such a responsible kid! And what's more important kay buotan jud ba! Kyle is just as cute as Koykoy and Kit now you have three gawpo king brothers. He looks like he is a bright and energetic kid. Even my 9 year old was asking only for books this year for Christmas? I can see why for the simple facts that the art work on book illustrations can be out of this world. I think it is great that these kids are willing to learn always instead of being influenced to do things that would be considered bad habits! Atty. told me he received your text yesterday. By the way I did mention your regards to him and he always smiles when I mention your name. That place your at looks really neat? thanks for the picx maau na lang mora kog naka anha ug Bangkok.